There are many ways to tell a homeless person where they can’t sleep, and a nonprofit in Iowa City has noted that installing park benches with center armrests is one of them. For a cost of about $150,000, Iowa City has scattered benches around the Pedestrian Mall with center armrests, allegedly for comfort. Iowa City Catholic Workers say that the real purpose is to prevent homeless people from sleeping on them. The Iowa City Catholic Workers, established in 2016 in the Davenport Diocese, is unincorporated and is not found in the IRS Charities search engine or GuideStar. They obtained a home in trust in August of 2018 to “provide hospitality and refuge for the poor” but cannot accommodate all who need shelter. To back up their claim that the city is designing to deter the homeless, the nonprofit released a transcript of a city work session from 2013 that includes a discussion of the idea of using center armrests on benches to prevent people from sleeping. The idea was brought up by a former city council member—now mayor—Jim Throgmorton. Throgmorton says the transcript is taken out of context; there was a case in 2013 of a man pulling a knife on someone at the Ped Mall a few days before the 2013 work session. Throgmorton stated that the city is working on programs for the less fortunate, specifically with a $200 million Behavioral Access Center and new housing. Public forums were held regarding the benches and the design and did not receive pushback. The Iowa Catholic workers remain unpersuaded. The city is now considering removing some of the benches. Iowa City is not the first to use design in an effort to make homeless people disappear (or move elsewhere). Last August, the Guardian reported that in Los Angeles’ skid row area businesses had paid for a six-foot-high fence surrounding a sidewalk. While that fence was removed, fences have appeared in other locations as business owners fence off sidewalk sections to keep homeless folks away. Statistics put the homeless count in Skid Row at about 4,250 out of 52,765 in all of Los Angeles County. In New York City, residents can call to complain that homeless people on the sidewalk have created a hazardous condition or that someone is sleeping out on a dangerously cold night. NPQ shared the story in 2015 of architecture designed to push away homeless people. Strategies employed range from sprinklers to window ledges and bus shelter seats that are pitched forward so they can accommodate pigeons but not a tired person in search of somewhere to sleep. Indeed, famous New York bookstore The Strand took a particularly harsh approach, dousing those sleeping rough under its famous red awnings with a blast of cold water every night. The message here is clear: This space is not for anyone other than the building’s clients, and the homeless are not welcome. This past September, homeless advocates in Boise, Idaho won a round when a federal appeals court ruled that cities cannot make sleeping on a public street or sidewalk a criminal act. 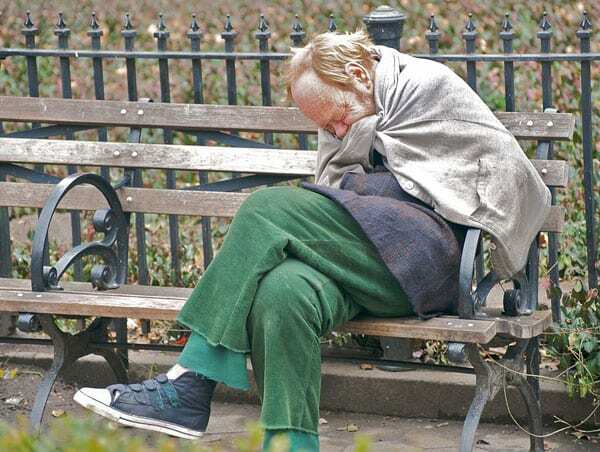 It may not be considered a crime to sleep on a city bench, but there will still be many who seek to get homeless people to “move along.” As NPQ’s Derrick Rhayn noted last year, hostility to the urban homeless is not independent of growing gentrification in many of our cities. Many died in a high-rise, public housing fire in London where tenants had been organizing for safer conditions but nobody listened. Who is accountable—the private management and development company or the local government that outsourced the function?